The move is expected to cause hundreds of thousands of Israelis to apply for a license immediately. 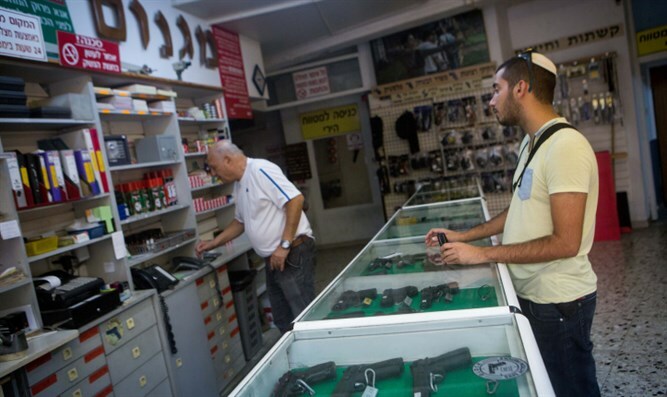 Israel will significantly relax its regulations governing gun licenses, a move that would instantly allow hundreds of thousands of Israelis to acquire a firearm. According to Haaretz, Public Security Minister Gilad Erdan will allow any Israeli who underwent level 07 rifle training in the IDF to apply for a gun license. All infantry soldiers are certified as 07, in addition to all combat squad commanders and the majority of IDF officers. The vast majority of IDF soldiers aren't combat soldiers and are certified as level 02. While the police do not oppose the move, it requested that the mandatory training course be expanded to four and a half hours from the current two. The updated guidelines are a direct result of efforts by the Knesset's Gun Lobby head Likud MK Amir Ohana, who has long pressed for Israel to relax its tightly regulated firearms industry in order to allow citizens to protect themselves from terrorism. "A civilian carrying a weapon is more of a solution than a threat, and doubles as assistance for the security forces," Ohana told Haaretz, pointing out that "in 11 attacks in just the Jerusalem area, they neutralized the threat." "Sending the citizens of Israel to protect themselves with pizza trays, selfie sticks, guitars and umbrellas is a crime of the state against its citizens. A law abiding citizen, who has the basic skill required, is entitled to be able to defend himself and his surroundings." Ohana was referring to the various creative ways Israelis have neutralized terrorist over the past few years. In one famous case, a citizen neutralized a terrorist with a guitar during a terror attack on the Jaffa boardwalk while another used a selfie stick to put an end to a stabbing spree. Unlike the US, Israel does not allow unlimited gun ownership and strictly controls who is allowed to own a weapon. Citizens wishing to be armed must be over 21 and have a valid reason for needing a gun, such as living in Judea and Samaria or working in a hazardous environment. Buying assault weapons is forbidden and every gun owner is only allowed to own up to 50 bullets. However, Erdan has significantly relaxed the guidelines regulating gun ownership, especially after the outbreak of 2015's 'Stabbing Intifada" which saw Israelis being attacked on a daily basis. In 2016, Erdan dropped the minimum age of gun ownership to 21, allowed every IDF officer with the rank of Lieutenant and graduates of special forces units to purchase a firearm and permitted off-duty security guards to take home their weapons.